Until now, it’s been a real challenge to create a pro-level custom effects system that’s both portable and powerful. 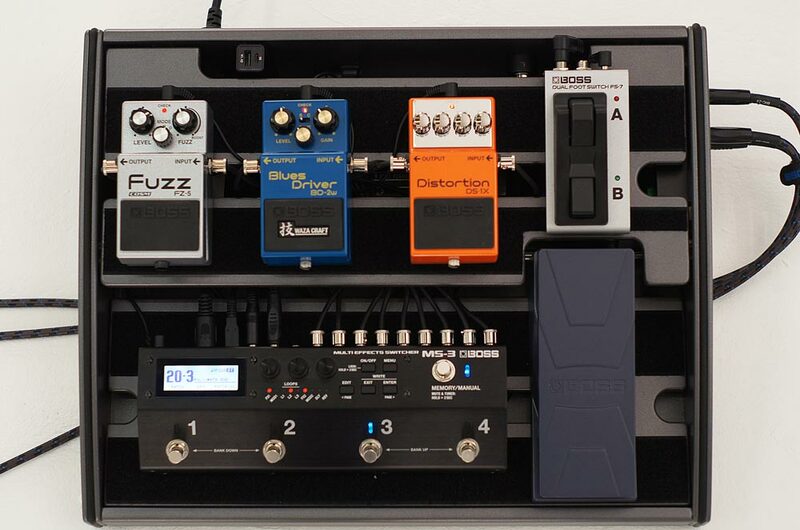 Building a serious pedalboard with an advanced loop switcher and tons of pedals is really cool, and the right way to go for many situations. But the downside is that it’s big and heavy, and simply too much for certain gigs. On top of that, the pedals, components, and cabling quickly add up to a surprisingly hefty price tag. Alternately, you can get a small multi-effects unit that does it all in one box, but then you have to give up using your favorite stomps. By integrating a loop switcher and rig controller with a BOSS multi-effects engine, the MS-3 gives you the best of all worlds without any of the downsides. 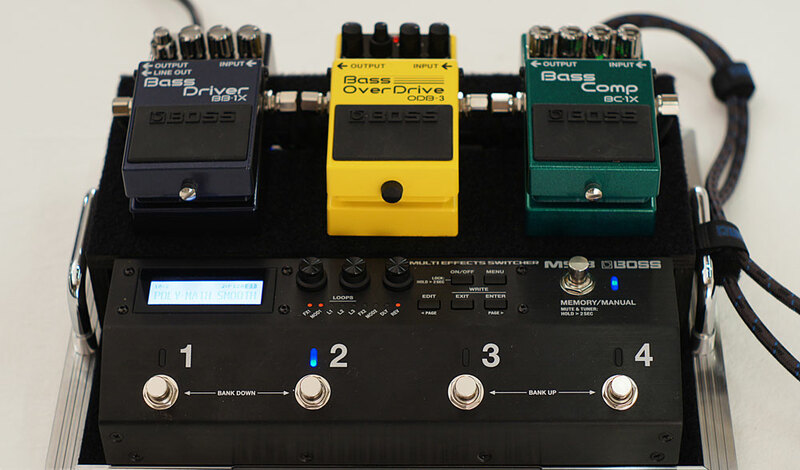 The BOSS MS-3 Multi Effects Switcher enables you to build a powerful custom pedalboard with a minimal footprint. While it’s primarily designed as a central hub for a pedalboard, the compact MS-3 can also function as a standalone effects processor with or without external pedals. This makes it a great choice for touring pros who need a grab-and-go solution for fly dates, or in-town players who like to throw things in a bag and travel as light as possible. The MS-3 is also ideal for beginning players just getting into effects. Its huge onboard selection delivers immediate access to all kinds of great sounds, and provides a broad foundation to start exploring the world of effects. And when you start getting into stompbox pedals, it’s easy to integrate them into your system via the MS-3’s loops. The MS-3 also functions as ultra-compact standalone effects unit that’s perfect for everyone from traveling pros to beginning players. Derived from the BOSS GT series, the multi-effects engine in the MS-3 offers 112 effects types that are organized into six simultaneous categories. A history of BOSS effects processing is at your creative command, from overdrives, distortions, and delays to pitch and modulation effects, reverbs, and more. And if you’re a bass player, the MS-3 features a number of effects types specially optimized for use with bass. The MS-3 also includes a built-in tuner, plus a dedicated noise suppressor that can be tweaked for the needs of each patch. And with the handy global EQ, it’s easy to adjust your overall sound for different amps and performance venues. With the three audio loops in the MS-3, you can bring your favorite drive pedals and other stompboxes into the mix. Once your pedals are connected, you’re able to switch the loops on/off individually, and position the MS-3’s onboard effects around them any way you want. Connection options fill the MS-3’s rear panel. In addition to its onboard effects and external loops, the MS-3 includes many powerful features for real-time control. You can save your effects setups in 200 patches and 50 banks, and recall them with the four main footswitches. A quick press of a fifth footswitch lets you engage Manual mode to switch individual effects on/off, while a longer press mutes the sound and calls up the MS-3’s built-in tuner. If you like, you can change the default functions of the footswitches to perform different operations on a per-patch basis. On the back of the MS-3, you have tons of options for expanded rig control. You can connect external footswitches for tap tempo, effects on/off, and parameter adjustment, and expression pedals for volume, wah, pitch shift, and more. Control out jacks let you switch channels on your amp and control effects like the DD-7, RC-1, and others that support external control. There’s a MIDI output as well for sending tempo, PC, and CC information to MIDI-enabled pedals such as the DD-500 Digital Delay, MD-500 Modulation, and RV-500 Reverb. In addition to its guitar-based effects, the MS-3 Multi Effects Switcher includes many effects specifically optimized for bass. With the MS-3’s intuitive panel interface, it’s easy to edit effects, adjust control assignments, and save patches. But it’s even easier when you connect to your computer with a USB cable and use the free MS-3 Editor/Librarian software. Via a convenient graphic interface, you have big-screen access to all MS-3 parameters. You can also back up and restore individual patches, and organize groups of patches into Live Sets for various gigs. The MS-3 Editor/Librarian will be available as a free download in August 2017. To learn more about the powerful and innovative MS-3, visit the product page at Boss.info.